Definition at line 49 of file llvieweruictrlfactory.h. Definition at line 58 of file llvieweruictrlfactory.cpp. References LL_COLOR_SWATCH_CTRL_TAG, LL_INVENTORY_PANEL_TAG, LL_JOYSTICK_SLIDE, LL_JOYSTICK_TURN, LL_MEDIA_REMOTE_CTRL_TAG, LL_NAME_EDITOR_TAG, LL_NAME_LIST_CTRL_TAG, LL_TEXT_EDITOR_TAG, LL_TEXTURE_CTRL_TAG, LL_WEB_BROWSER_CTRL_TAG, and LLUICtrlCreator< T >::registerCreator(). Definition at line 79 of file llvieweruictrlfactory.cpp. Definition at line 87 of file llvieweruictrlfactory.cpp. Referenced by LLPanelEditWearable::draw(), LLPanelFace::getState(), and LLPanelFace::sendColor(). Definition at line 127 of file llvieweruictrlfactory.cpp. Definition at line 122 of file llvieweruictrlfactory.cpp. Definition at line 117 of file llvieweruictrlfactory.cpp. Definition at line 112 of file llvieweruictrlfactory.cpp. Referenced by LLPanelAvatar::onClickAddFriend(), LLPanelAvatar::onClickCSR(), LLPanelAvatar::onClickIM(), LLPanelAvatar::onClickMute(), LLPanelAvatar::onClickTrack(), and LLPanelAvatar::setAvatarID(). Definition at line 92 of file llvieweruictrlfactory.cpp. 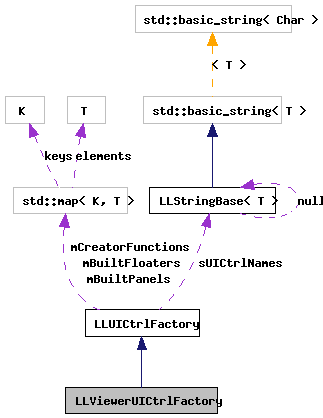 Referenced by LLPanelEstateInfo::accessRemoveCore(), LLPanelEstateInfo::checkRemovalButton(), LLPanelEstateInfo::clearAccessLists(), LLDispatchSetEstateAccess::operator()(), LLPanelEstateInfo::postBuild(), and LLFloaterNewIM::postBuild(). Definition at line 97 of file llvieweruictrlfactory.cpp. Referenced by LLPanelEditWearable::addTextureDropTarget(), LLPanelEditWearable::draw(), LLPanelObject::getState(), LLPanelFace::getState(), LLPanelPlace::postBuild(), LLPanelPick::postBuild(), LLPanelClassified::postBuild(), LLPanelRegionTextureInfo::refreshFromRegion(), LLFloaterSellLandUI::refreshUI(), LLFloaterBuyLandUI::refreshUI(), LLPanelRegionTextureInfo::sendUpdate(), and LLPanelRegionTextureInfo::validateTextureSizes(). Definition at line 107 of file llvieweruictrlfactory.cpp. Referenced by LLPreviewNotecard::canClose(), LLPreviewNotecard::draw(), LLPreviewNotecard::getDragItem(), LLPreviewNotecard::hasEmbeddedInventory(), LLPreviewNotecard::LLPreviewNotecard(), LLPreviewNotecard::loadAsset(), LLPreviewNotecard::onLoadComplete(), LLPreviewNotecard::onSaveComplete(), LLFloaterIMPanel::postBuild(), LLPreviewNotecard::saveIfNeeded(), and LLPreviewNotecard::setEnabled(). Definition at line 102 of file llvieweruictrlfactory.cpp. Referenced by LLFloaterHtml::LLFloaterHtml(), LLFloaterReleaseMsg::LLFloaterReleaseMsg(), and LLPanelDirFindAll::postBuild().